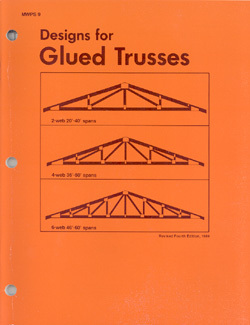 Designs for Glued Trusses discusses planning, building, and erecting clear-span gable roof trusses. Lumber grades of 1,100f, 1,400f, and 1,600f. Maximum allowable roof loads are given for each truss design. Because this book presents truss plans that are based on old or outdated building codes, these plans are to be used only as conceptual information. Neither MWPS nor any of the cooperating land-grant universities or their respective agents or employees have made and do not hereby make any representation, warranty, or covenant with respect to the specifications for the trusses described in this book.